Investigators and onlookers at the scene of the murder yesterday morning. 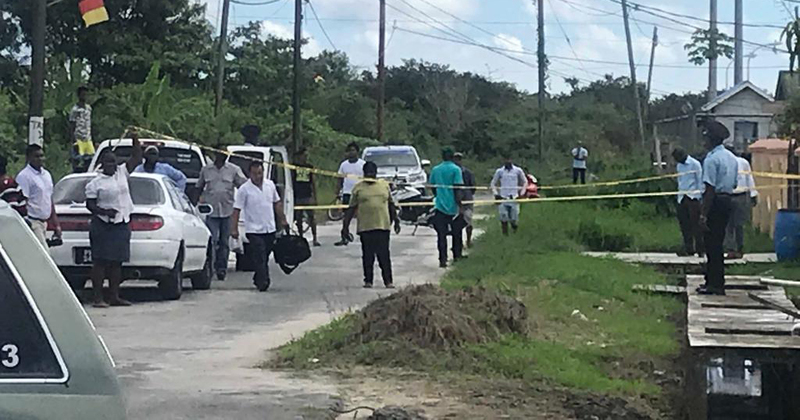 A man was bludgeoned and chopped to death by his brother-in-law yesterday morning at Golden Grove, East Bank Demerara. The dead man has been identified as Justin Peterkin, 39, of Paradise, East Coast Demerara, who was a father of two. The reason for the murder was not clear. The attack occurred around 8.30 am, when police say Peterkin and the suspect, who has been identified as Anthony King, of Princes Street, Wortmanville, were visiting the family home of Peterkin’s wife, Cassandra King, located at 1323 Section ‘C’ Block ‘Y’ Golden Grove. 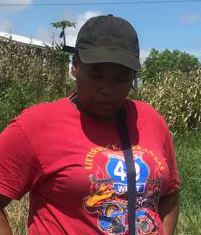 Police said in a statement that their investigations revealed that Peterkin and the suspect visited the Golden Grove property and soon after the occupants [the owner and daughter] left for work. An eyewitness subsequently saw the suspect chopping his in-law in the yard, police added. An alarm was raised and the suspect was promptly arrested by the police who were summoned, the police added. 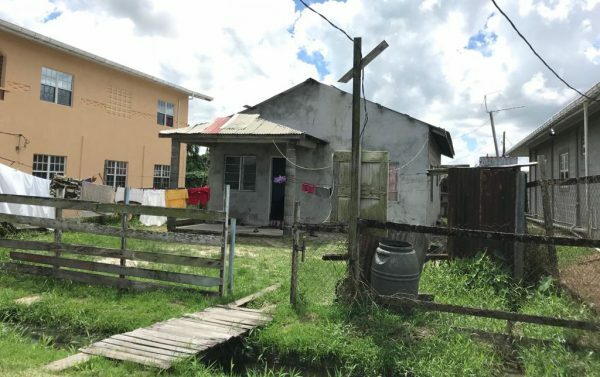 Stabroek News learnt that Peterkin was first attacked with a hammer and after falling unconscious, the suspect used a chopper to inflict wounds to his body. From all indications, Peterkin was attacked at the entrance of the home and was found in a pool of blood. A neighbour, Daniel Boutrin, told reporters that he was sitting with his wife in their yard when he noticed the suspect acting unusually. 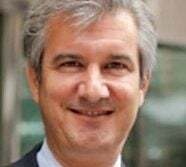 He noted that the same time, he heard someone panting for breath but he took it for nothing since he was unaware that Peterkin was also in the house. “…After I hear a loud breathing, I see a man by the fence and I ask her (Boutrin’s common-law wife) if she knows him and she said yes but long she didn’t see him around. He was walking around the yard looking anxious…,” the witness related. He added that not long after, he heard a strange noise coming from his neighbour’s home, forcing him to investigate. had a chopper on the man neck lashing it with the hammer… and I turn and tell my wife, ‘Ay the man killing a man over there.’ She think was joke when she come and see, she said is the electrician man,” he recalled. After observing what was transpiring, Boutrin said he and his wife went into their home. “I run upstairs to the verandah and holler on he [the suspect] and he run out the yard,” he said. Boutrin added that he chased after the suspect and sought the help of residents but his efforts were futile. He noted that he followed the man to the police outpost and alerted the police and the man was arrested. During the chase, he recounted that the suspect threated to kill him but he picked up a piece of wood to defend himself. Meanwhile, as word of the killing spread through the village, scores of curious villagers gathered at the crime scene. Police, however, arrived and managed to cordon off the crime scene. Although Peterkin was visiting Cassandra King’s home, he was expected to carry out works at Boutrin’s residence. “He come to fix a light here but he had told my wife he will come over just now to fix it. I didn’t know he was in the area ’til when my wife tell me…,” the neighbour said. Cassandra King was unclear what may have triggered the attack on Peterkin. She explained she was at work when she got a call. “All the person saying on the phone, ‘I sorry! I sorry!’ When I get here, I see this… I am sorry! Please tell his mother I am sorry…,’” she said, while noting that she suspects the caller was her brother. To her knowledge, there was no dispute between Peterkin and her brother.